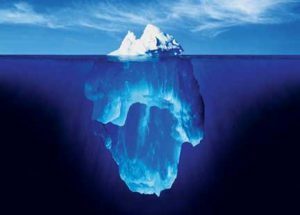 With all due respect to theoreticians who continue to use the iceberg metaphor to describe culture, I think it’s time to retire the image altogether. Here’s why. Most people with any background in intercultural communication theory agree that culture is not a “thing”; it is the process whereby groups of people coordinate meaning and action, yielding both institutional artifacts and patterns of behavior. We feel it is unfair when anthropologists and critical theorists accuse us of essentializing culture. But many interculturalists actually do essentialize culture by using the objective metaphor of an iceberg. Comparing culture to an iceberg floating in the sea implies that culture is an actual thing. The 10% above the water is really visible to everyone who looks in that direction, and the 90% below the water is both real and dangerous, since it can sink the unwary sojourner. The metaphor does not in any way imply that culture is a process of coordinating meaning and action – rather, it implies that culture is an entity with mysterious unknown qualities. So, while we ourselves may not romanticize or exotify foreign cultures, we inadvertently support those who do by teaching this metaphor. This situation is a great example of paradigmatic confusion. We want our students or clients to engage culture in a dynamic way, enabling them to understand complex cultural identity formation and generate mindful intercultural communication. These are laudable goals drawn from a constructivist paradigm. But then we introduce the topic with a distinctly positivist metaphor – the iceberg. The client is left with a simplistic understanding of culture that cannot support the complex operations vis a vis culture that we subsequently advocate. In other words, we are shooting ourselves in the foot with this metaphor. Let’s find a more appropriate one. For many years I described culture metaphorically as a river that both carved and was constrained by its banks. While this gets at the “co-ontological” construction of boundary conditions, it doesn’t really capture the coordination of meaning idea. The seemingly related idea of a river (e.g. the Amazon) with tributaries flowing into it strikes me as being another paradigmatically confused metaphor, since it implies that cultural diversity (relativism) disappears into a transcendent unity (positivism). Other ideas?